All told, whether it’s wearing a Plymouth or Dodge badge, Neon ranks as good value–and a sensible choice–among subcompact cars. Watch out for engine overheating or blown head gaskets. Both are expensive to repair. 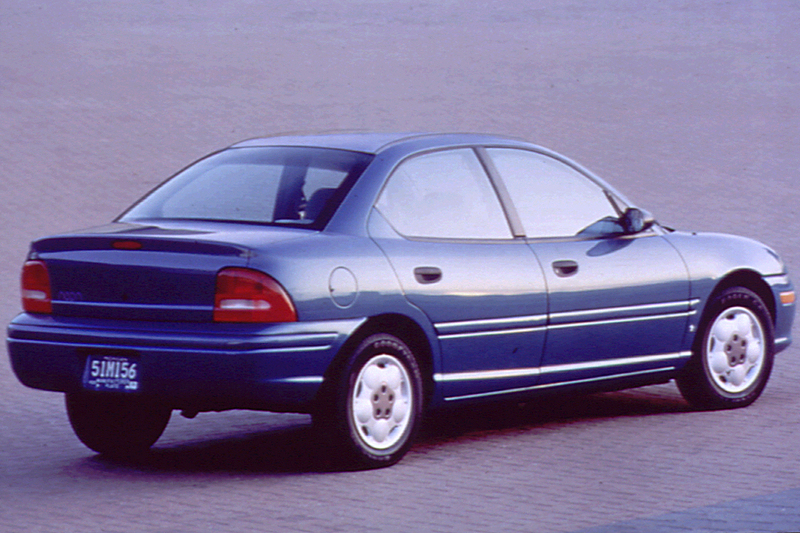 Chrysler Corporation’s subcompact front-drive Neon was introduced as a very early 1995 model available in virtually identical form through both Dodge and Plymouth dealers. 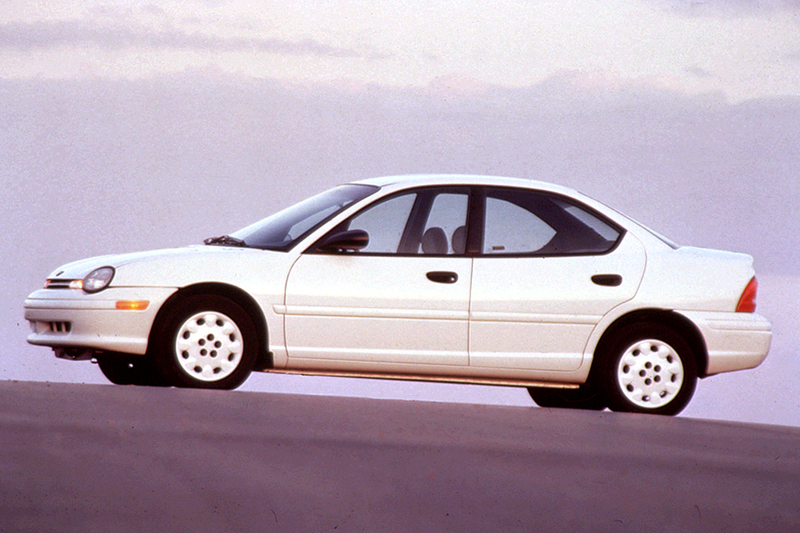 First offered only as a 4-door sedan, Neon gained a 2-door coupe running mate later in that year. 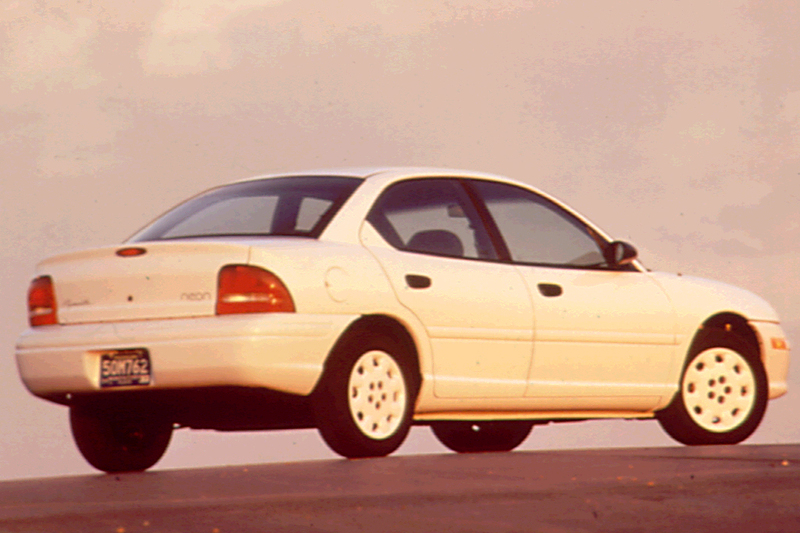 While sedans have been sold in base, Highline, and Sport price levels, until 1996 the coupe came only in Highline and Sport. Early Neons all carried a 132-horsepower 2.0-liter 4-cylinder engine. A 5-speed manual transmission was standard; 3-speed automatic optional. Dual airbags were standard, while antilock brakes were standard on Sport models and optional on others. Base models now rode 14-inch tires (formerly 13-inch), and body-colored bumpers replaced the prior gray bumpers. A less-expensive base-model coupe joined the lineup, making each body style available in three levels: base, Highline, and Sport. Initially standard on Sport models, antilock brakes and a rear spoiler dropped to the option list on all Neons. The 150-horsepower engine was available on base coupes equipped with a Competition Group, which included 4-wheel disc brakes, aluminum wheels, quicker-ratio power steering, a stiffer suspension, heavy-duty radiator, and a tachometer. 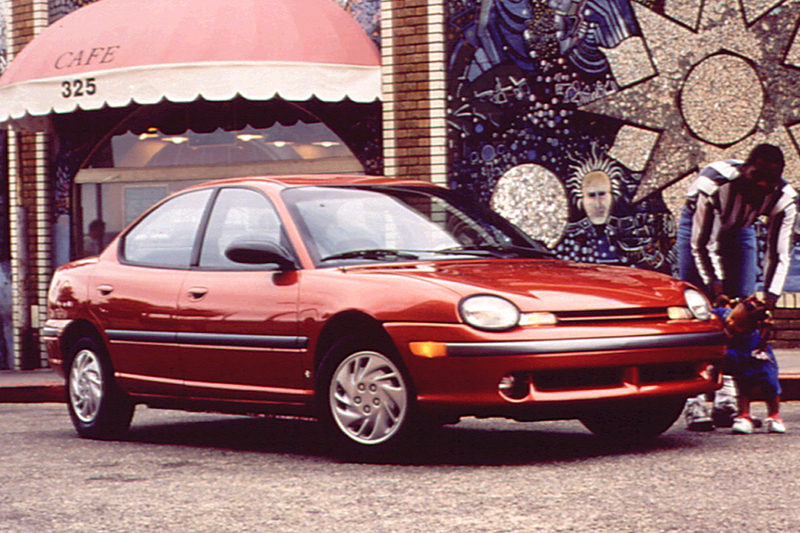 Neon Sport models disappeared after 1996, but a new Expresso package included fog lights, a rear spoiler, 14-inch wheel covers, and special body graphics. 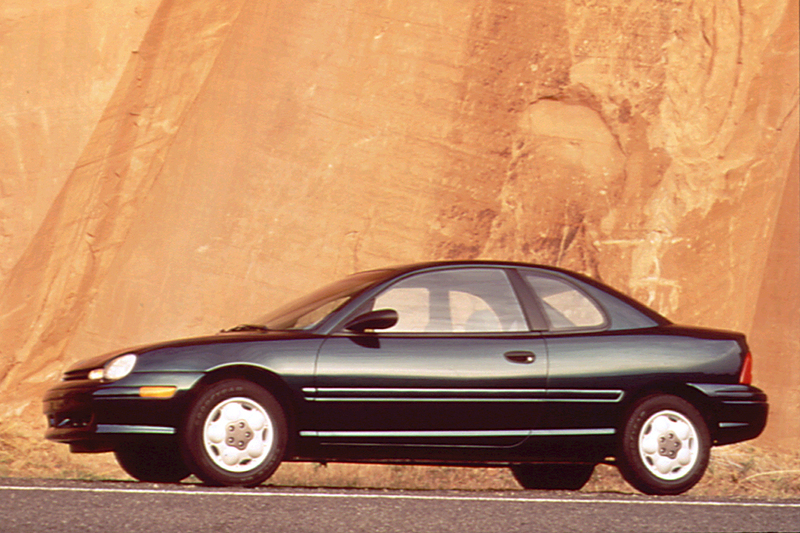 The Base model was dropped for ’98, leaving only Highline and Competition trim levels. An all-new Neon debuted in early 1999, but some 4-door and 2-door models of the old design remained on sale throughout ’99. DaimlerChrysler expected to drop the Plymouth-badged Neons after the 2001 model year, as part of the phaseout of the Plymouth brand. Most Neons got a 132-horsepower, 2.0-liter 4-cylinder engine with a single-overhead cam. A dual-overhead-camshaft version of the 2.0-liter four could be installed in the Neon Sport (and later in other models), delivering 150 horsepower but just a bit more torque than the base engine. A 5-speed manual gearbox was standard; 3-speed automatic transmission (no overdrive gear ratio) optional. Base-engine acceleration has been surprisingly swift: about 8.9 seconds to reach 60 mph. We also averaged more than 31 mpg, driving mainly on expressways. However, it idles noisily and growls loudly during acceleration. The optional dual-cam engine feels only a little livelier than the base engine–not enough to make it a priority. Automatic-transmission shift action is too abrupt with either engine. Ride quality rivals that of many larger cars–especially with 14-inch tires installed. The Neon’s suspension takes bumps and potholes in stride, soaking up most of them without disturbing the occupants unduly. At the same time, a Neon handles more like a sports car than a small sedan. Body lean in hard cornering is minimal, and the Neon’s tires grip tautly. The car feels solid and well-planted on the road. Firm, responsive steering feels natural and centers quickly. Four 6-footers fit without squeezing in the spacious interior, which belies the car’s outer dimensions. Visibility is excellent to the front and sides but because the rear parcel shelf is high the view to the rear is somewhat obstructed. The Neon’s trunk opens at bumper level, and the split rear seatback folds down to expand the cargo area. Description: Corrosion at fuel and rear-brake tubes may lead to brake fluid or fuel leakage. Description: Steering-column coupler can become disconnected when vehicle sustains underbody impact. Description: Brake master cylinder can leak. Description: Wiring harness in Mexican-built cars could short-circuit; can cause various malfunctions, including stalling. Description: Airbag could deploy inadvertently when ignition is shut off. Description: Rear-suspension crossmember on some cars may be missing spot welds; can result in structural cracks in body, and reduced rear-impact crash protection. Description: Front-suspension lower control arms may have been inadequately welded and could separate.